Fall is one of the best times to get outside and enjoy the Canadian landscape. With all the brightly coloured leaves and the diversity of panoramas, why not hit the road and admire the beauty of this country? Canada has some of the most beautiful roadways in the world. Explore the beautiful scenery of the Canadian wilderness, the coastline and cities. Here are 5 of the most beautiful scenic road trips. 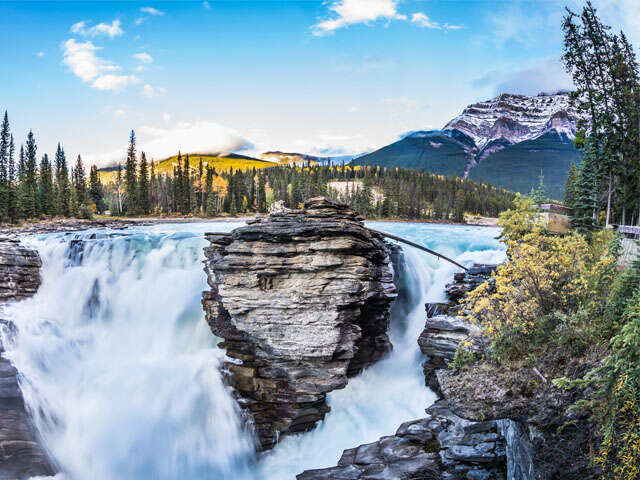 Edmonton: Edmonton is probably one of the better-known scenic spots in Canada with two UNESCO World Heritage Parks to visit in Edmonton, as well as Jasper National Park and the National Park from Calgary. You will see waterfalls, glacier peaks, lakes and scenic mountains. New Brunswick: You witness tides move over 16 metres from high to low with beautiful beaches, breathtaking landscapes and impressive water forms. Why not stop by St. Stephen, the oldest independent candy maker in Canada. Sea to Sky Highway (Squamish to Whistler, British Columbia): Take a drive from Vancouver to Whistler and experience the beauty of the mountainous coastline of British Columbia. Eastern Townships, Quebec: Seclusion, nature, and quaint French-style bed and breakfasts await travelers of the Eastern Townships route. Visit a Benedictine monastery, gourmet restaurants and isolated wineries in this region. Vancouver to Tofino: This is where you’ll find the famous Pacific Rim Highway. ​Jump your car to bask in the beauty of Canada. Ask your UNIGLOBE Consultant about saving up to 25% off base rate, plus other great offers!